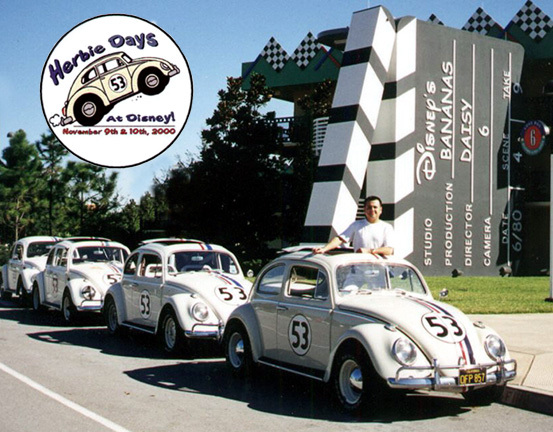 Herbie Days at Disney 2000 & THE LOVE BUG Resort Page! And the home page for Disney's Love Bug themed resort! Click on the thumb nail images above to view pictures from the event! AN EDITED VERSION OF MY ARTICLE (SEE BELOW) WAS PUBLISHED IN THE APRIL 2001 ISSUE OF VW TRENDS MAGAZINE. 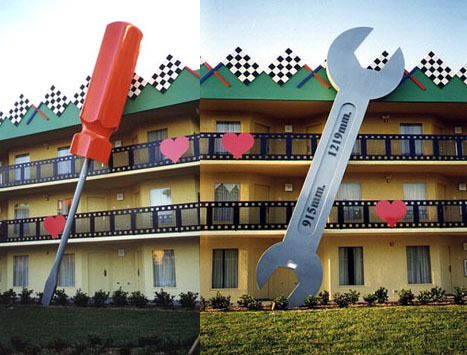 bring them all together at Walt Disney's Love Bug Themed hotel and what do you get? The first ever Love Bug fan club Herbie show! Known as "Herbie Days at Disney!" this event was the first ever show for the Love bug fan club. The event began on Thursday, November 9th with a small caravan. My wife Cindy and our daughter Carly took the lead in a white '98 New Beetle. I followed with my 1963 Herbie replica. We later picked up two more Herbies. One, a 1963 Disney original owned by Greg Carr of Brandon, Florida, and the other which was owned by Tory Alonzo of Midland Texas. Fellow Herbie lover Don "Gumby" Jordan rode shotgun in Tory's 1964 Herbie replica. What a trip it was having three Herbies cruising up the interstate. One Herbie never fails to grab attention, but three Herbies together nearly caused a traffic accident! The trip to Orlando was a quick one. 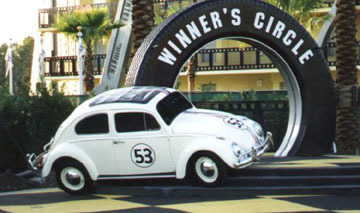 When we arrived at Disney's All-Star Movies Resort several Herbie fans and another Herbie were waiting for our arrival. Our Disney group assistant was Jason Elliot. 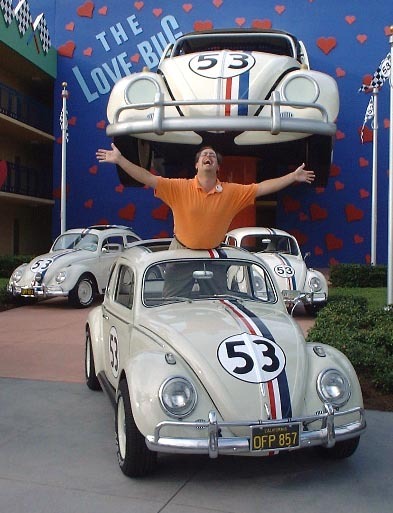 Jason was gracious in letting the Herbie group park up in front of one of the Love Bug building's huge Herbie icons for a quick photo session. Jason even posed for a quick pic. His "king of the world" stance pretty much summed up the enthusiasm of the participants of this event. After the photo shoot the group met at the "winner's Circle" where Disney's original Magic Kingdom Parade Herbie is on display. 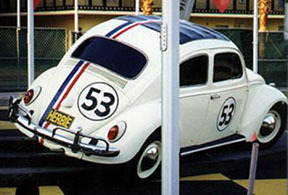 This Herbie was used in Disney World's parades up till 1990 when it was placed in storage. The car was removed and restored exclusively for display at the resort. As the fan club members gathered around Herbie several people shared some of their Herbie memorabilia. Greg Carr and I both brought some cool Herbie items to show and to trade. There were Herbie hats, pins, posters, original photos and more. Fan club members had a blast looking through each other's collections. Next on the agenda was dinner at the Planet Hollywood restaurant in Orlando. This globe shaped restaurant features three floors filled with movie memorabilia, including an original Disney Herbie that was used in the 1980 film, Herbie Goes Bananas. Herbie hangs from the ceiling with lights blinking and his front headlamps turned (a movie stunt feature). "To all Herbie owners- Aren't you happy that we didn't use Ferrari? Herbie was named after a character I used in my ski routine in Las Vegas. ' I only ski with Herbies.' The foolish thing I did was not want to do the sequels. Fifty-three was chosen because 54 was a series on T.V. and 55 was the speed limit. Towards the end of dinner came the arrival of the fan club's special guests, Joaquin Garay III and his wife Brandi. Joaquin played the little boy "Paco" in Herbie Goes Bananas. As expected, the Herbie fans were excited. Kids ran to get autographs from "their star" while the parents snapped away with the cameras. After Joaquin and Brandi had completed their meal they made their way outside and into the parking lot with the Herbie drivers. After another batch of photos Joaquin jumped behind the wheel and took my Herbie for a spin.. It was exciting to watch "Paco" cruise with his "good friend" for the first time in more than 20 years! The caravan of Herbies made their way back to the hotel. The plan was to gather together in one room and tell Herbie stories. Joaquin, Brandi, Phillip, Don, Tory, Rene, Greg and myself were up to the wee hours of the morning listening to Joaquin's recollections of filming Herbie Goes Bananas. Our group was also entertained by Phillip who performed scene by scene and line by line re-enactments of various Herbie movie scenes. Joaquin was quick to join in. Phillip kept us in stitches with his various character impersonations, including non-herbie characters such as Dr. Evil from the Austin Powers movie series. Trust me, you HAD to have been there. Don, Tory, and myself "closed" the place down by hitting the sack at 4 A.M.! Yeah, we had to be up at 7 a.m. for breakfast! That morning the club met for breakfast. We then gathered in the parking lot and formed a caravan to Walt Disney World. Our good friend Rene was kind enough to use his Disney clout to exempt our group from the parking fees as we made our way into the park. Disney even provided special up front parking just for our Herbies! Misty rain filled the sky but failed to dampen our spirits. Before long the sky would be clear and the day would turn out to be wonderful. Our Disney guide Chris Kellough provided a unique Herbie themed fact sheet for the group's entertainment. Since we had such a diverse group everyone went their separate ways and vowed to meet at lunch time. When lunch finally arrived the group was a bit smaller. Rene had taken Don, Tory, and Greg on a park hopping adventure (three different Disney Parks). The rest of us hooked up with Joaquin and Brandi for lunch. The lunch was a cool casual place and it gave us an opportunity to know Joaquin and Brandi a little better. Joaquin informed us that he is working on other film projects and would love to be cast in the upcoming Herbie film. Let's keep our fingers crossed! After lunch, we all went our separate ways. Most of the group arrived at the hotel around 5pm that night. Don, Tory and I decided to cruise two Herbie's around Disney for some fun. Let me tell you, we had nothing but smiles and compliments. In fact, we were stopped several times! People could not get enough of Herbie!!! It was a complete and total blast! If you ever get the chance to cruise two or more Herbies together PLEASE do it. We ended up meeting with Rene and that's when I called it a night. Sunday was check out for our VW family. New friends were made and a ton of fun was had at our little event. Joaquin once again obliged us and posed for some unique pictures with the group of Herbies. He also hopped in Greg's Herbie #2 for a quick (and I mean QUICK) ride around the parking lot. When Greg finally stopped to let him out, I heard Joaquin exclaim that he may have to get a Herbie for himself! Herbie Days was coming to a close. Those who were not planning on attending Bug jam said good-bye to their new Herbie family and went their separate ways. It was a truly wonderful experience that I cannot wait to do again! Thanks to VW Trends' printing of my Herbie article last June 2000, a lot of new people have been inspired to create their own Herbie replicas. Hopefully, come next Herbie event we will have 100 Herbies in attendance! It could happen! I want to say a major thank you to Joaquin and Brandi Garay for taking their time to thrill a bunch of Herbie fans, A lot of people made Herbie Days the huge success that it was; everyone who brought their car and/or just brought themselves. YOU guys made this show a success!!! Greg Carr, Tory Alonzo, Don Jordan, Tom and Dee Cammarata, Jason Haag, The Gonser family, the Smith family, the Clark family, and many others. Without all of you there would not have been a Herbie Days. Check Out Disney's LOVE BUG Resort! 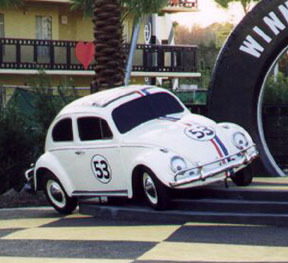 What's This, A Herbie Themed Resort? Hello everyone. 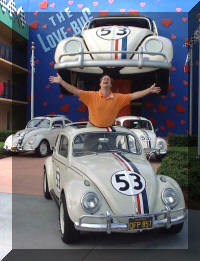 Thank you for visiting the new Herbie The Love Bug Resort page. In January of 1999 Disneyworld in Orlando, Florida opened their ALL STAR MOVIES resort complex. Two of the buildings in this movie themed complex are devoted to The Love Bug. 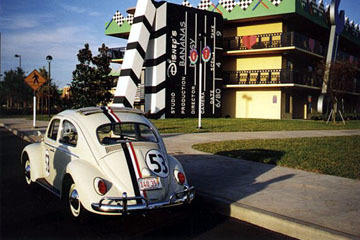 The Herbie themed buildings are decorated in a Herbie & racing motif. On each building there is a huge piece of Herbie (see pics below). One building has the front of Herbie while the other has the back. They are enormous! At night, both halves of the car are illuminated for some awesome effects! It really brings the Herbies to life! The buildings also feature huge automotive tools mounted to the buildings (see photos). Lastly, the courtyard has a restored Herbie (ex-Disney parade car) on permanent display. This resort complex is a primo destination for all vacationing VW (and Herbie) enthusiasts! If you are ever in Orlando you MUST check it out! 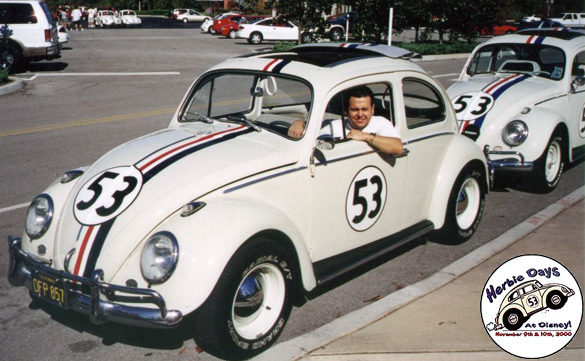 And who knows, you just might see Herbie cruising around the property. 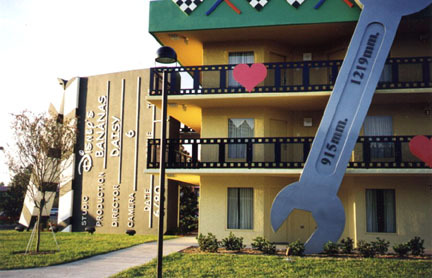 If you're planning at this Disney resort please remember to request the LOVE BUG buildings or you may end up sleeping in a different themed hotel! Booking is per the complex, not per the theme, so make sure you are clear in your request. Prices for the All Star Movies resort is a bargain compared to other Disney hotels so these rooms go very fast. Don't hesitate. Call and make your reservations today! I do not have any pricing info or numbers for you to call at this time (sorry). And I must point out that currently (2.2001) Disney does not sell ANY Herbie item in the gift shop of the All Star Movies resort. You have been warned. Disney is FINALLY carrying some Herbie items in their hotel gift shop! Of course, there is no guarantee that these items will remain in stock. Just know that there might be some hope for a Herbie souvenir yet! If you would like to share your hotel experience please send me mail by clicking Herbie's Mail Box. And don't forget, if you want to get back to my main page just click here.